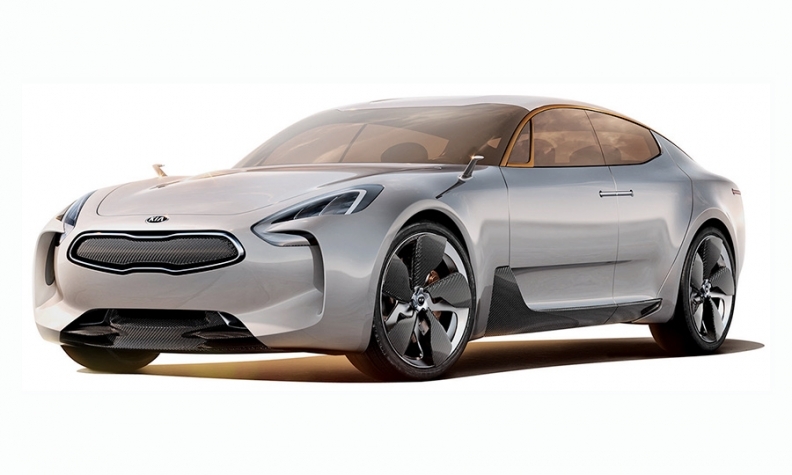 Kia GT concept: a production version is due in 2017. The new Kia halo car is expected to appear in 2017, according to a person familiar with the company's plans. Kia shared plans for the rear-wheel drive, mid-luxury car to be equipped with a V-6 engine with U.S. dealers last week at a meeting in Las Vegas. The car is expected to take aim at the Audi A7 and the BMW 5-series GT, Edmunds.com reported earlier. Like the concept, the production version will be a four-door fastback, Edmunds says. And like the upmarket Kia K900 luxury sedan, it is intended to attract new buyers to the brand with its design and upscale features. The GT concept introduced at the Frankfurt auto show in 2011 featured rear-hinged suicide doors, though that feature is not expected to make it into a production version of the yet-unnamed car.